It has been one of my recurring themes that just two kinds of people have been getting richer in this country: the top executives who sit on each others’ boards and vote each other a rising share of private sector work, and unionized public employees (or at least older generations thereof in certain places) who benefitted from political deals to retroactively increase their already relatively rich retirement benefits. Everyone else has been getting poorer, working its way up the income and educational ladder since the mid-1970s. There are, in other words, the bonus rich and the years in retirement rich, the executive/financial class, the political/union class, and the serfs. In general the executive/financial class has ruled the federal government, and the political/union class has ruled state and local governments in some places (including New York), over the past 30 or so years. This power is reflected in the tax code. At the federal level, however, these two classes have one thing in common. Relatively little of their income is in wages and salaries, which the federal government taxes twice. More of it is in the form of untaxed employer-provided benefits, pensions and other retirement income, and investment income taxed at a lower rate. For the serfs work earnings — wage income or self-employment income — is often all they get. The common view is that while state and local taxes are generally “regressive,” falling harder on those who earn and have less, federal taxes are “progressive,” falling harder on those who have and earn more. Based on the progressive federal income tax. That view, however, becomes less true once generational equity and the payroll tax are taken into account. and includes a link to a table with the tax situation of two hypothetical couples, the Senior Voters and the Young Hopefuls. First, let’s simply the tax burden chart from the prior post to focus on federal taxes alone. The data show that the Senior Voters, with their retirement and investment income of $130,000, do in fact pay a higher share of their income in federal income taxes than the Young Hopefuls, who earn just $80,000. The Young Hopefuls benefit from the additional exemption for their child, which reduces their taxable income by $3,950, and the child tax credit and child care tax credit, which cut their taxes owed by $1,600. With these benefits, and the standard deduction, they end up paying just 9.3% of their income in federal income taxes. Their “marginal” tax rate on their last dollar of income is 25.0%. The Senior Voters do not benefit from these breaks, and end up paying 14.9% of their income in federal income taxes. Their marginal tax rate, on their last dollar of retirement income, is 28.0%. Moreover, the Young Hopefuls are benefitting from an annual Obamacare subsidy of $2,668, which allows them to be covered by health insurance. Taxpayers are paying for this. This is something that did not exist the last time I did the analysis. There is more to the distinction between the Young Hopefuls and the Senior Voters than first appears, however. The Senior Voters have their health insurance entirely paid for by New York City taxpayers, and this income – perhaps $15,000 – is totally exempt from federal, state and local income taxes. In fact as far as the tax system is concerned, it doesn’t count as income at all. The total federal income tax subsidy for private tax insurance paid for entirely or in part by employers was $185 billion in 2013, according to the Government Accounting Office. The cost of this exclusion, and the cost of private health insurance paid for by taxpayers on behalf of civilian public employees and their relatives, is why I found that when you add it up the federal, state and local governments were already paying for more than three-quarters of third party (non-cash) health care expenditures, even before Obamacare. Thus making the objection that doing anything for anyone else, such as for the Young Hopefuls, would be “socialized medicine” a bunch of bunk. Moreover, within a few years the Senior Voters will be collecting Social Security and Medicare. Social Security is cash income, but the first $20,000 of that income is exempted from federal income taxes, over and above any other exemptions and deductions the Senior Voters will be due. Medicare also doesn’t count as taxable income, and is far more generous than the Obamacare the Young Hopefuls receive. Because of the benefits that don’t count as income the Senior Voters are in reality modestly advantaged with regard to the federal income tax on the revenue side, but more importantly Senior Voters are increasingly advantaged on the expenditure side, as a high and rising share of federal expenditure ends up going to senior voters. In the U.S. (as in the U.K.) today’s seniors get more benefits every time the economy is up, but are spared any sacrifice any time the economy is down. Those sacrifices are foisted solely on the young, something no is willing to talk about here, although The Economist was willing to point it out in the U.K.
And even object on moral grounds. It seems that all “right wing” “fiscal conservatives” think alike when it comes to cutting public spending, and not cutting it. Another large federal tax break goes to the very rich, who take their income in the form of capital gains, at least in comparison with moderately rich wage and self employment income earners. Capital gains, which were only taxed at 15.0% by the federal income tax for many years, are now taxed at 15.0% for income up to $413,200 (compared with 35.0% for wage and salary or self employment income) and 20.0% for income in excess of $413,200 (compared with 39.6% for wage and salary or self employment income). The national press has covered this issue in detail, so lets move on to a less frequently discussed issue – the payroll tax. Neither the rich nor the retired pay the federal payroll tax, which in theory is dedicated to Social Security and Medicare, on their capital gains, investment and retirement income. The payroll tax falls on wage and self employment income alone. Perhaps that is the reason that when talking about who pays taxes, those who pander to the rich and the retired pretend that the payroll tax doesn’t count. And even assert that those paying substantial payroll taxes but no income taxes (because they are too poor) are bunch of freeloaders. Including one of the 2012 Presidential candidates. For wage and salary employees, the payroll tax rate is nominally 7.5% of wage income for the employee and 7.5% of wage income for the employer, for a total of 15.0%. Of this amount 12.4% in total and 6.2% for each is only assessed on (in 2014) the first $117,000 in income. So not only is the tax limited to cash work earnings only, but also it absorbs a lower percent of that income for those earning over $117,000. For someone earning $234,000, the tax would absorb just 9.2% of the total wage base, not 15.0%. I use the word “nominally” for the employer and employee shares because of the concept of “tax incidence” – the person or entity on which a tax is assessed isn’t necessarily the person or entity that pays it. That cost could be shifted to someone else, depending on what happens in the labor or consumer marketplace. In theory that entire 15.0% payroll tax might be paid neither by the employer nor the employee, but rather by the customers, as it is included in the price of goods. Or the employees might try to shift their share to employer by holding out for higher wages to offset the payroll tax they have to pay. It is more likely, however, given the way the labor market has worked for 35-plus years, that the employees are paying the employee share AND the employer share, the latter in lower wage increases. After all, wage increases have certainly been fatter for those over the payroll tax limit in recent decades. For those workers, higher pay does not also require a higher employer payroll tax contribution. There is no doubt, moreover, that the worker pays the entire 15.0% if they are self-employed. As it happens, self-employed “freelancers” and “contract workers” including quite a few “permalancers” are a growing share of the workforce, particularly among younger generations. Employers are required to offer non-wage benefits equally to all employees equally to have those benefits exempted from federal income taxes. So at first, the tax break for benefits led to more equal compensation for employees. But businesses can get around this requirement – and other labor protections – by deciding that their younger employees are not employees. And that is what has been happening. And as it happens, New York City is one of the places where this trend is most advanced. 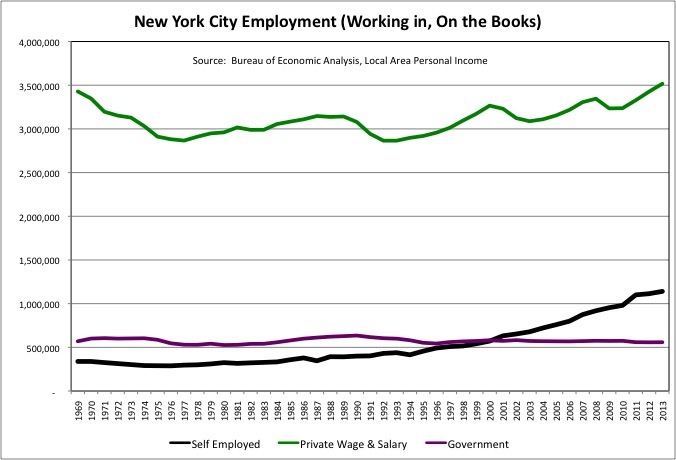 Recently, finally, the number of private wage and salary workers working in New York City increased to a level higher than it had been in 1969, about 3.5 million. From 1976 to 2013, however, the number of self-employed workers (including “self-employed” workers) in the city tripled to more than 1.1 million, and it is still rising fast. 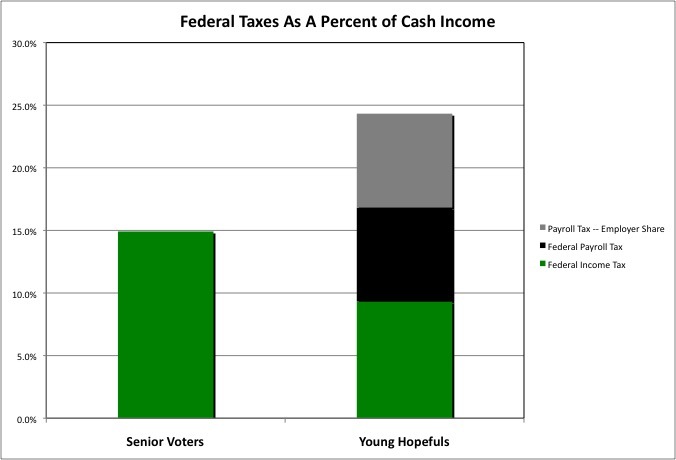 Even assuming that the Young Hopefuls pay just one half of the payroll tax, their total federal tax burden would be 16.8% of income, a higher burden than the 14.9% of income that the Senior Voters would pay in federal income taxes alone. Even though the Senior Voters had a higher income. If the Young Hopefuls are, directly or indirectly, paying both halves of the payroll tax, their total federal tax burden would be 24.3% of their income, far higher than what the richer Senior Voters would pay. There is one more component to the payroll tax: the Earned Income Tax Credit (EITC). This payment by the federal government to working poor families (or reduction in income taxes owed) is intended, in part, to offset their payroll tax burden, so they aren’t being taxed into poverty. But the Young Hopefuls are too well off to qualify for the federal EITC. Now the Senior Voters could make a simple response to all this. They may not be paying payroll taxes now, and may soon be receiving public benefits funded by those taxes, but they paid their share when they were working themselves. Thus they have already paid their share — on a lifetime basis. Up until 1983 (when they were age 29), however, they (and those older) paid a far lower payroll tax rate than everyone has been required to pay since. That massive Reagan payroll tax increase, following the massive Reagan income tax cut, hit the self-employed particularly hard. More importantly, the amount of tax the Senior Voters paid during their working lives is not nearly enough to fund the benefits they are going to get, something pointed out over and over again for the past few decades, but something that politicians representing Generation Greed have refused to do anything about. Here, once again, is a link to a useful summary of the situation – from nearly 20 years ago. By starting now they meant 1996, when the article was published. But Generation Greed wanted more tax cuts instead, not increases. After the Reagan tax cuts, the Bush II tax cuts. And what would benefits be like if the books were balanced solely by cutting them, but those born before 1958 were exempted from all sacrifices? Because that is what the Republicans propose. “For the benefit of future generations.” The same Republicans who pushed through an expansion of Medicare benefits for today’s seniors a little more than a decade ago. And that is also where the Democrats probably want things to end up by default. After all, that’s what they do with public employee pensions – retroactively enrich them for those cashing and moving out, and then slash them for younger generations. In Illinois, a recent pension fix for teachers, who don’t get Social Security, will force new ones to pay MORE THAN 100 percent of the cost of their own pensions, to make up for those who came before. If the courts don’t overturn it. It was passed by a Democratic legislature and a Democratic Governor. So what would I propose to make federal taxes more equitable on a generational basis, and perhaps more progressive as well? Replace the regressive, worker only-payroll tax with less regressive, everyone pays as they spend their money Value Added Tax (VAT). The knee jerk response of those on the so-called left is that the VAT, like other sales taxes, is “regressive,” because that’s what they were told in college. It is certainly more regressive than the progressive federal income tax, so when those on the so-called right propose replacing the income tax with a VAT, those on the left have a case. If the VAT replaces the payroll tax, however, things are different. Consider New York’s favorite plutocrat, former Mayor Mike Bloomberg. I’m not sure if he bothers to pay himself a salary, but even if he does he only pays most of the payroll tax on the first $117,000 of his income. He can spend $millions, and pay nothing more or, if all his income is investment income, pay nothing at all. Were a VAT to take the place of the payroll tax, he would pay it every time he spent money in the United States. And, of course, the Senior Voters would pay the VAT on their spending, compared with nothing in payroll taxes. Lobbyists for them, with their usual lack of enlightened self interest, would probably claim that after having paid payroll tax while working, they would be forced to pay a second time for the VAT too in retirement. Without considering that new young workers would have to pay the VAT throughout their lives, while working and in retirement, and would almost certainly end up paying more than the Senior Voters in total taxes. Even with substantial cuts in old age benefits, the government needs to money after all those decades of irresponsible finance. What about the burden on poor retirees? Well, if a (say) 12 percent VAT were shifted entirely to consumers (even though employers would no longer be paying a 7.5 percent payroll tax on the first $117,000 of their employees wages), and consumer prices were to rise by 12 percent as result, would not Social Security payments and other entitlements be adjusted for inflation as well? That wouldn’t necessarily be true of pension and investment income, but retirees with a lot of pension and investment income aren’t poor. Shifting from a payroll tax to a VAT would allow affluent seniors to share some of the burden of getting their children and grandchildren out of the hole – their hole. Not by sacrificing more or even as much, but by giving up something. Moreover, ignore tax incidence for a moment and consider who would directly pay the tax. The payroll tax is, in theory, half paid by employers and half by employees. But a VAT would be paid entirely by employers, business, government, and non-profit (no exceptions – every one of them has employees and customers getting or someday getting Social Security and other entitlements after all). One of the left’s favorite Social Security solutions is to eliminate the cap on contributions and tax every dollar of wage and self-employment income at the full 15.0%. Under that solution, however, benefits and investment income would still continue to be entirely exempt from the tax, which falls on work income alone. Under a VAT, on the other hand, each business or other organization would owe the tax on its value added. Which is the organization’s sales or receipts, minus the cost of purchased goods and services as inputs. Guess what that adds to? A tax on every last dollar of wages (as in the case of lifting the cap on Social Security contributions) – AND employee benefits AND profits! Under which option do the better off pay more? Assuming the VAT was passed on to customers, moreover, there would be economic advantages as well as generational equity advantages. One of our problems is that people are bankrupting themselves to keep up with the Joneses. Think of a VAT as a tax on the spendthrift Joneses. One of our problems is that Americans are the people the whole world wants to sell to, but no one wants to hire, at least at the compensation level required to live here. Replace the payroll tax with a VAT and the tax on work disappears, and a tax on selling takes its place. Today, a company considering locating a factory here or elsewhere knows that if the factory is in the U.S., there will be a payroll tax burden on the work done here, but if the factory is located in many other countries, that tax burden on work would be low or zero. But a VAT would be assessed on goods and services sold in the U.S., whether they were produced here or somewhere else. Heck, I wouldn’t mind lifting the exemptions and standard deduction for the federal income tax so high that only the upper middle class and wealthy pay it, and using a higher VAT rate to pay for all the entitlements – every federal program to meet the basic needs of the people. Those rich enough to pay the federal income tax would be left to, in addition, fund the stuff rich people care about. Military spending, interest on the debts they supported increasing by voting Republican, the Congress they buy, the courts that protect their prerogatives (and only rarely provide the redress of grievances), etc. And in 2016 Presidential candidate Romney could claim that 90 percent of Americans are freeloaders who pay no (federal income) taxes. But this is all theoretical. Our political system has degenerated into a servant of powerful interests, not a competition to see who has better ideas to make things better for everyone in the long run. What we can say is that at the federal level the payroll tax, and what it pays for, means the tax system as a whole has been unfair to poorer, younger generations and average workers. It benefits those with high retirement, non-wage benefit and investment incomes at the expense of workers, particularly those earning less than $117,000.